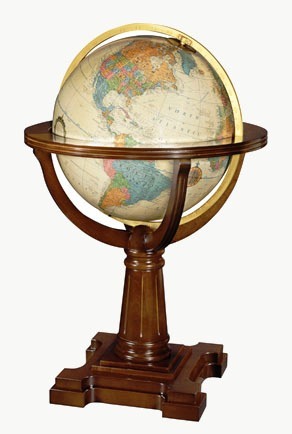 Part of Replogle's Heirloom Collection, the Annapolis Floor Globe sits atop an ornate hardwood pedestal base. This limited edition globe features more than 4,000 place names and comes with a keepsake plaque and World Atlas. With the flip of a switch, the acrylic globe ball emits a soft light. The brushed brass full meridian complements the traditional color scheme and antiqued oceans. Replogle's Heirloom Annapolis Floor Globe is backed by a one-year warranty.